Click on the pictures for a closer look. Or schedule a real tour and see what our wonderful facility has to offer your child. Tiny Tots is where our infants, aged 6 weeks to 1 year, play and grow. It features age appropriate toys and activity centers in bright, engaging colors. There are individual cribs for nap time, and a quiet corner to relax in. Teddy Bear is a fun filled room for our toddlers, aged 1-2 years. Here they start to learn their ABCs, colors, shapes and numbers. 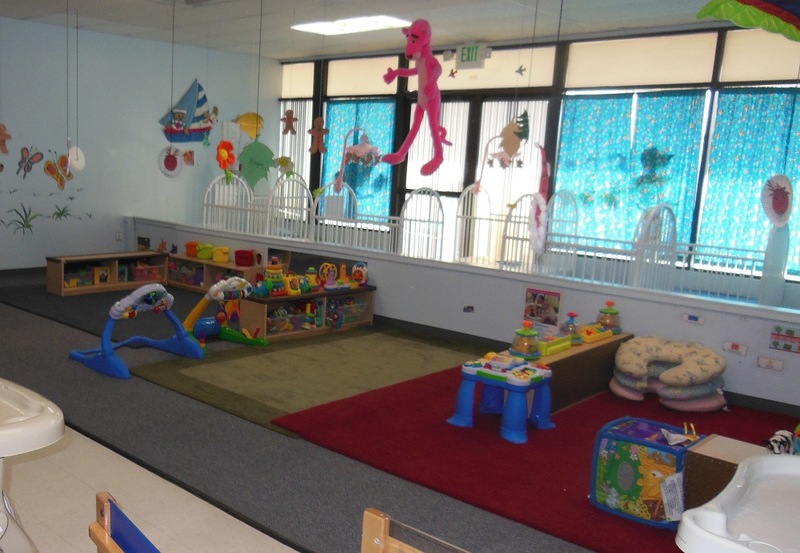 A wide variety of toys, books and activity centers are available for their young minds to explore. We have mats for daily nap time, and a cozy corner for curling up with a pillow or soft toy. Our Butterflies are our preschool-aged children. Their room offers toys and centers that stimulate the imagination and make learning fun and exciting. There are mats for nap time (or quiet time, if your child no longer naps). We also have a large cozy corner for reading or if a child just needs a little space. The Sunshine Room is for our pre-kindergarten kids, aged 4-6. Art, math, science, reading, dramatic play, and more are featured in our centers and activity stations. We also have a computer with educational games available in this room.